According to Sri Kali Charan Bannerjee, Swami Vivekananda, while strolling with some of his disciples on the roof of the late Balaram Basu's house in Calcutta in 1882 recalled the life and message of Guru Gobind Singh ji. He recited a passage which was current among the Sikhs: "Savaa lakh se ek ladda-on, tabh Gobind Singh naam kahaa-on!" As he spoke about Guru Gobind Singh, Swami's eyes flashed with a strange light, which fascinated his disciples, who gazed spellbound at his countenance and listened to him with rapt attention. "Guru Gobind Singh gave them (the common people) that both the Hindus and Muslims of the time were living under the regime of intense oppression and injustice. "Guru Gobind Singh not only created a common interest but also gave them the courage to realize it. So Hindus and Muslims alike followed him. He was a great devotee of God's just power (sakti sadak). His type is rare in India's history." The following excerpt from the lecture delivered by Swami Vivekananda at a meeting of students of Foreman Christian College, Lahore - arranged by Prof. Tirath Ram, later famous as Swami Ram Tirath - in 1897, was brought to our attention by the late S. Kartar Singh of Dagshai (Himachal Pradesh, India). "This is the land [United Punjab] which is held to be the highest in the whole of Aryavarta. This is the Brahmavarta of which our Manu speaks. This is the land of Punjab from whence arose that mighty aspiration after the spirit, aye, which, in times to come, as history shows, is to deluge the world. "This is the land where. like its mighty rivers, spiritual aspirations have arisen and joined their strength, till they travelled over the lebgth and breadth of the world, and declared themselves with a voice of thunder. This is the land which, after all its sufferings, has not yet entirely lost its glory and its strength. "Here it was that, in later times, the gentle Nanak, preached his marvelous love for mankind. Here it was that his broad heart was opened, and his arms outstreched to embrace the whole world. Here it was that one of the last - and one of the most glorious heroes of our race - Guru Gobind Singh arose. "The great Guru after shedding his blood, and that of his dearest and nearest, for the cause of religion, for the sake of the down-trodden, the victimized, even when deserted by those for whom this blood was shed, retired into the South, without a word of complaint against his country or his men, without a single word of murmur. "For India's re-glorification, you must, each one of you, become Guru Gobind Singh - his true follower." *This reference is from the translation of a Bengali book, Swami Sisya Sambad, by Sarat Chandra Chakrabarty, published by Swami Atmabodhananda of the Utbodhan Karyalaya, Calcutta, India. 1: N. Singh (Canada), April 20, 2010, 7:24 AM. What a beautiful and inspiring quotation ... it re-affirms what I have always believed that the day will come once when 'Raj Karega Khalsa'! 2: H.S. Vachoa (U.S.A.), April 20, 2010, 8:24 AM. The Swami had his own reasons to admire Guru Gobind Singh ... not all of them kosher! Like other shallow so-called Hindu "upper"-castes, he saw in the revival of Sikhi an antidote to Islam. 3: Taran (London, United Kingdom), April 20, 2010, 11:06 AM. Is that all from the Swami? 4: Surinder (Massachusetts, U.S.A.), April 21, 2010, 9:24 AM. What a state of affairs! The swami is offering the best and the deepest possible regards to our Gurus and we cannot even accept that. How contrarian and argumentative have we have become! If a Muslim from Pakistan would have uttered the smallest praise for our Gurus, we would be all rolling on the floor. 5: H.S. Vachoa (U.S.A.), April 21, 2010, 1:35 PM. Surinder, though his words are welcome, all I'm saying is that we can't ignore the fact that this swami openly extolled a Hindu Aryavarta. 6: Gurinder Singh Johal (Amritsar, Punjab), April 26, 2010, 7:14 PM. 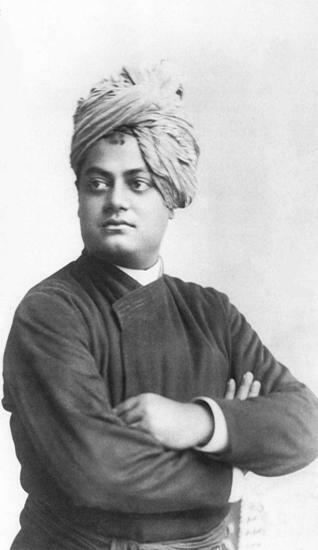 It is to the credit of swami Vivekananda that he was impressed with the great sacrifice and he did not hesitate to share this knowledge with his people. 7: Mohd. Raja (U.S.A.), September 27, 2011, 11:14 PM. I am Pakistani, but my mom is hindu. We have lived a secret life back at home. But now in the U.S., we're openly into Sikhism as well as my mother's traditions. What surprises me is the anger expressed by some Sikhs against Hindus, even though I know of the terrible things Hindus have done against Sikhs in recent times, not unlike what Muslims have done through history. Comment on "The Swami's Guru"